Discount available! 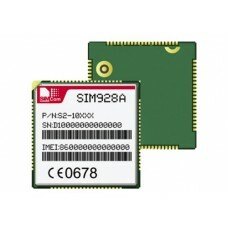 Recommend SIM928A Module Wireless GSM / GPRS / GPS to your friends and get your Discount. The SIM928A is a module that integrates into a single container a GSM / GPRS quadriband and GPS. The mobile phone section is GSM / GPRS type and can operate in the GSM 850 MHz as well as on the bands of 900 MHz (EGSM), DCS 1800 MHz and PCS 1900 MHz. The module supports GPRS multi-slot of Classes 10 and 8, and the coding schemes CS-1, CS-2, CS-3 and CS-4. The power of the mobile phone is placed in Class 4 (2W) for GSM 850 and EGSM 900, and in class 1 (1W) in the DCS 1800 and PCS 1900. As regards the part of the GPS, is to 132 channels and offers excellent performance in fact the time required to first fix (TTFF time to first Fix): 1 second hot start and 28 sec cold start. The sensitivity of -148 dBm -167 dBm in normal mode and in tracking mode and the refresh is well to 1 Hz, which means to obtain the data on positioning (accurate to less than 2.5 meters) updated every second. In terms of connectivity, this stupendous module has two UARTs (UART and UART1) for serial communication and also integrates TCP / IP functionality and extended AT commands to manage it. Its compact dimensions (30x30x3 mm), allow to develop very compact devices such as trackers, GSM telephone combiners,remote alarms, etc. The module is surface mount (SMT), so requires no connector.